JERUSALEM: An Israeli ex-minister charged with spying for the country’s arch-foe Iran has reached a plea bargain with prosecutors that will see him serve 11 years in prison, the justice ministry said yesterday. As part of the agreement, Gonen Segev will plead guilty to serious espionage and transfer of information to the enemy, the ministry said in a statement. 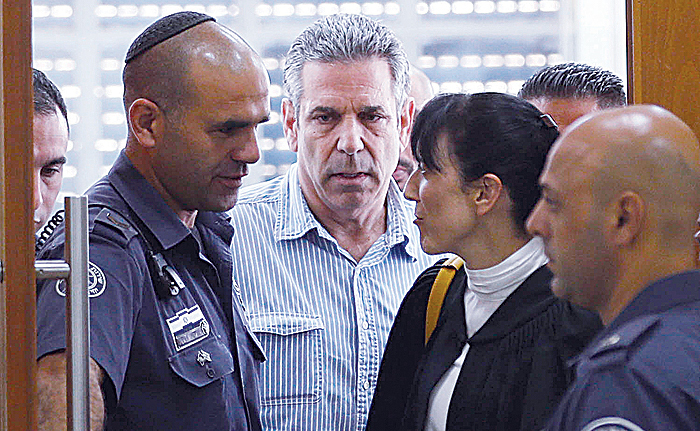 Segev’s lawyers, Eli Zohar and Moshe Mazor, said in a statement that as part of the deal a charge of treason was dropped. “Indeed Mr. Segev had contacts with Iranians, but his motive was not ‘to aid the enemy in time of war’ – treason. That is why that offence was removed, inter alia, from the amended indictment. “The amended charge sheet filed today and the plea bargain that was reached, returns this case to its natural and proper proportions,” the Hebrew-language statement said. A sentencing hearing was set for February 11. The trial of Segev, who served as energy and infrastructure minister from 1995 to 1996, opened in July but was held behind closed doors in the Jerusalem district court, with few details of the accusations publicly released. The original charges, as published by the justice ministry, were aiding an enemy in wartime, serious espionage, attempted serious espionage and passing information to the enemy. The Shin Bet internal security service accused him in a statement at the time of providing Iran with “information related to the energy market, security sites in Israel, buildings and officials in political and security bodies, and more” while he was living in Nigeria between 2012 and his arrest at Israel’s Ben Gurion airport in May 2018. The Shin Bet said Segev had been in contact with Iranian embassy officials in Nigeria and later he visited the Islamic republic for meetings with his intelligence “handlers”. Segev served in the Labour government of prime minister Yitzhak Rabin after defecting from the far right to cast the decisive vote in favour of the Oslo II peace agreement with the Palestinians. He has previously served prison time on criminal charges.